At the end of September, Google updated Wear OS with a few Google Fit features and a new notifications system that brings browsing, dismissing, and shortcuts. A trip assistant is now available with Google Assistant as well, and it also includes suggestions for restaurants. Thanks to this update, Wear OS devices get "proactive and personalized help." 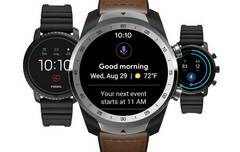 Last week, Google updated Wear OS for all supported devices, delivering what the tech giant calls "proactive and personalized help" and is the most health-focused update of this mobile platform for wearables released so far. As usual, those who own a Wear OS device should go to Settings > System > About > System Updates and check for the availability of the new firmware. If nothing shows up, you should try again in a few days. If you get the update, it would be nice to drop a comment below and let us know what you think about it once it's done.